A fan of skirts and chinos? This A-line design combines both. Made from supersoft cotton, it has a touch of elastane for stretch. A generous helping of stitch detailing adds a smart touch to the seams and waistband. …stop talking about this beautifully luxurious, semi-fitted take on a classic. The silk-blend fabric adds a textural dimension to any outfit – whether you pair it with jeans, cigarette pants or a cinched-in skirt. Pro tip: you can even wear this long-sleeved blouse open as a chic evening cover-up. Seasonal weather is no match for our figure-skimming denim dress. Princess seams nip in the bodice, while pleats kick the skirt out into a A-line. Triple-stitched details on the neck and down the front add to the tough-as-jeans attitude, while the exposed grosgrain pull is a true Boden touch. Brunch with friends, 9am meetings or romantic dinner dates – there's nowhere this pencil skirt won't go. And with that contrast grosgrain ribbon you're bound to turn heads. Its British-milled tweed makes it an instant classic, while the full lining will keep you feeling cosy. We've taken your go-to A-line skirt and made it even better with a new range of vibrant prints. Made from easy-iron cotton poplin in a fit that sits just above your knee, it's just desperate to escape somewhere sunny with you. Get in the holiday mood with our flattering A-line skirt. The removable tie waistband creates a pleated effect, giving a little bit of volume and a whole lot of swish power. This 100% cotton design is fully lined too, so it's comfortable and drapey without being clingy. 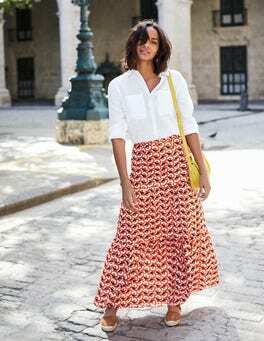 This maxi skirt is perfect for warm days. Made in a soft, drapey cupro fabric with a washed finish, it'll keep you cool as the temperature rises. The gathered high waist and a side split add to the dreamy look. And to seal the deal? Two wordsâ€”Side. Pockets. Say goodbye to boring work clothes with our slick, modern, ponte pencil skirt. An exposed zip and grosgrain ribbon tab will add more than a little sass to your workwear wardrobe. Coordinate with our ultra-stretchy ponte blazers – it's so comfortable you'll even last for a post-work Pinot. Sunsets, sangria and this dress – what more could you ever need? 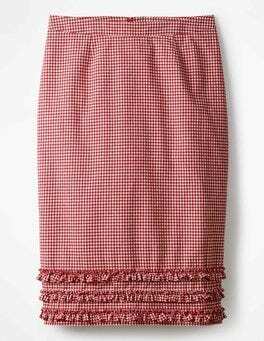 It’s comfortable, in soft jersey, and stylish with a tiered midi skirt, ruffle trims and cuffs. What’s more, the V-neck is ultra-flattering so you can simply throw it on and go. …instantly be on regular rotation. The trusty ottoman smooths your figure, and seam details at the front make it extra flattering. Smart enough for busy days in the office, the V-neck and just-above-the-knee skirt length give it that elegant edge for when you need to rush off to an evening soirée. Form a line for your new favourite A-line. Its supersoft moleskin fabric has a touch of stretch – and denim lovers, there's an option for you, too. Patch pockets give it a casual finish, while a full lining, printed waistband and grosgrain zip pull ensure it stands out from the crowd. Fun, feminine and flippy? You might call this the perfect skirt. It's flatteringly fitted at the hip and the fabric falls in elegant drapes. Made from enviably soft and lightweight viscose, this graceful piece sits just above the knee. Nail sophisticated style with this below-the-knee skirt. The heavy, textured cotton means it doesn’t wrinkle easily and those bold prints make it perfect for everything from work to weddings. Can't get enough? There's a matching dress too. If only your office diary was as streamlined as this skirt. It’s smart with panel details inserted at each side and structured in a wool blend with a touch of added stretch for comfort. Tuck in a silk blouse for the boardroom, or wear with the matching blazer. 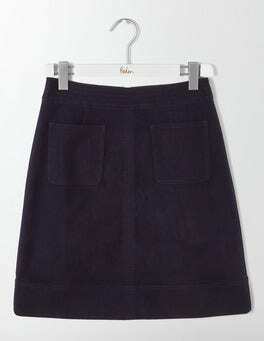 An icon of the Sixties, and now your wardrobe, the mini skirt is back in British-milled tweed. It's comfortable to wear with a slight A-line shape, above-the-knee cut and full lining. We've finished it off with slanted pockets and a grosgrain waistband. Colorful and bold, this skirt is guaranteed to brighten up your daysâ€”even the sunny ones. We've made sure our skirt has plenty of swish by adding large pleats that flare out from the fitted waist. Whatever your day holds, this cotton-poplin design will keep its shape from sunrise to sunset. Looking to make a statement? This luxurious organza skirt was designed to catch the eyeâ€”think vibrant floral embroidery, a full, gathered skirt and a grosgrain waistband. It's fully lined with cotton (which means it's super comfortable), and it's even got pockets. What's not to love? This flippy skirt is hard to resist. Firstly, it's a midi design that has a gentle drape and a floaty, feminine shape. Secondly, it's made from easy-care polyester that's machine washable, wears well and doesn't crease. We're sold. Swish your way through the day in our lightweight and floaty skirt. 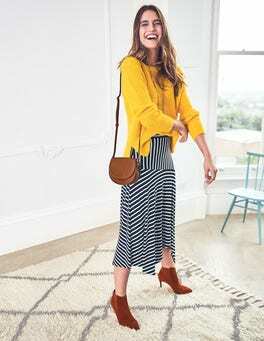 Its length maximises the midi trend, while multiple tiers with soft pleats and an in-house-designed floral print celebrate the very best of boho. Like a feminine finish? The breezy fabric drapes softly into an A-line shape. There's no need to skirt around luxury with this velvety and oh-so-slightly stretchy design (pun intended). Its gentle A-line shape skims the hips and sits above the knee for a flattering finish, with handy pockets on the sides. Wear with tights and a chunky knit to get that cosy feeling. 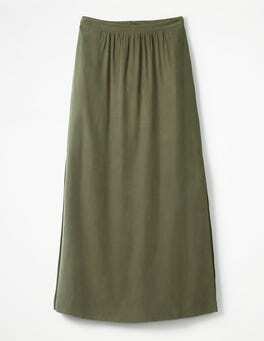 In an elegant midi length, this full skirt is just the ticket when you want something a little bit special. The shorter lining highlights the luxurious lace, and the full A-line shape and grosgrain waistband create a flattering shape. We like to think of this skirt as the 'yin-and-yang' pencil. With its sharp fitted shape and soft frills, it will bring harmony to work and weekend outfits. Constructed from 100% linen, the peplum hem kicks out to flattering effect. DJ booth or office printer? You’ll look great next to both. Floaty and feminine, our magical midi skirt can live up to any occasion. The statement floral print on the outside and full cotton underskirt on the inside mean it's so fun to wear you'll want to twirl all night. It's gathered at the waistband, too, for a flattering finish. Calling all free spirits: this lightweight skirt has a high-low hem for bohemian appeal. With two gathered layers and a floral print, it's a feminine choice for balmy days. The crease-free polyester is easy to care for – simply pop in the washing machine. Nothing beats a classic pencil skirt – except maybe our ultra-feminine take. The shape is flattering but comfortable for dashing about on busy days, but the Italian gingham weave and three lines of ruffles make sure it's not all work and no play. Comfort, meet style (yes, we're the perfect matchmakers). A silk velvet fabric makes this skirt super soft, while its high-waisted cut and below-knee length is as flattering as it gets. It's fully lined, and the material has a bit of stretch to help you sashay through your day with ease. How could the classic pencil skirt possibly be improved?' you cry. 'With a touch of Boden magic', we reply. This slinky style has a structured shape and is fully lined to keep you comfortable. The luxurious Italian fabric has a bold herringbone design, just to keep things interesting. Get ready to head straight to your happy place with the floaty fabric of this skirt. The lightweight georgette drapes to flatter, while the panelled design provides extra swish. It's beautifully finished with a full lining, concealed zip and contrasting grosgrain detail on the inside. Some things in life are best when they’re predictable (buses and bosses spring to mind). Others, less so. Take our stretchy midi skirt. With an asymmetric hem, flattering gathered seams and drapey blend, it gives casual outfits an unexpected twist. Delicate floral embroidery designed in-house + a flattering midi length = this dreamy skirt. Made from a super lightweight linen blend, it'll breezily transport you from breakfast meeting to rooftop cocktails. Dial up the drama with this sateen-finish midi skirt. It's cut in a feminine, full shape that exudes old Hollywood glamour. But it's not just dazzling to look at as the cotton blend will keep you cool and the elegant waistband has a figure-flattering effect. Smart chic: we’ve got it all stitched up with this below-knee skirt. At first look, it’s a classic – neutral block-colour, streamlined shape, flattering length. Double take to find the subtle detailing, like contrast stitching down the side seams. Add to basket? Yes, please. Introducing the best-looking paperbag you’ll ever see. This trend-led skirt is crafted from ultra-luxe Italian wool-blend fabric, and features a paperbag waist with a self-tie belt. 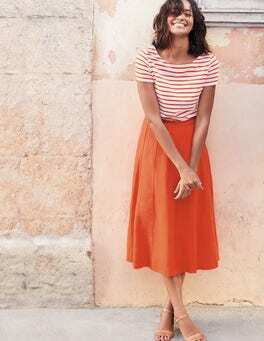 Pleats down the front and the modern, midi length create a flattering shape. Could it be any more chic? …by the feminine details of this delicate top. We crafted it from dainty fil coupe material with a subtle texture, and popped ruffles at the cuffs of the blouson sleeves. This versatile design looks great tucked into a pencil skirt for a Monday mornings or styled with denim for a lazy weekend brunch. …viscose fabric say 'all business' while the collarless style and carefree drape say 'hey, let's get drinks'. Yes, this breezy shirt has a lot to say for itself, with smart chest pocket details and a delicate spotty print. Switch out a pencil skirt for dark denim for a desk-to-dinner quick change. Strike up the band – it's time to party. This sleeveless dress has a full skirt, perfect for getting involved in energetic dance moves (or bringing a dash of glamour to family dinners). If that's not fabulous enough, our woven jacquard pattern has been designed in-house for added exclusivity. …all frill-seekers – this long-sleeved slub-cotton top is ready for an adventure. The striped design will fit seamlessly into your weekend wardrobe, whether worn with wide-leg jeans or a denim midi skirt. Ruffles at the cuff and neck add to the fun, making it easy to dial up the decadence at night. Embrace sunny-weather with this sophisticated maxi dress. The V-shaped neckline and twisted detail draw attention to your waist for a super-flattering shape that skims over any lumps or bumps. It's made of wonderfully drapey fabric, so you can chuck it in the case without worrying about creases. Even when the Great British weather can't make up its mind, this versatile dress is ready for anything. The timeless stripes look just as good with tights and boots as they do with sandals and bare legs when – at last – the sun decides to shine again.